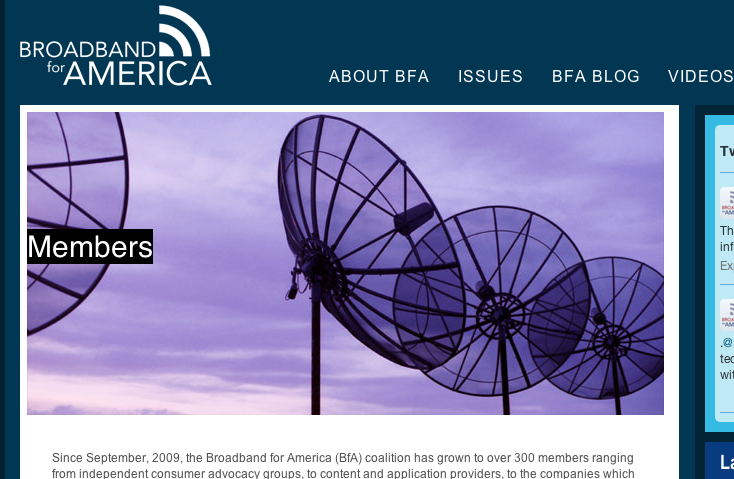 Broadband For America boasts 300 members, but some of them — like an Ohio advocacy group and a bed and breakfast — say they aren’t actually part of the coalition. Last week, we told you about the handful of in-name-only broadband advocacy groups that are funded by the cable and wireless industries and who are pushing its boneheaded talking points about net neutrality and how it will bring about the end of days if enacted (it won’t). We also pointed out how the member list of the questionably named Broadband For America coalition is littered with organizations — from nonexistent websites to a tile company and an Ohio inn — that are out of place next to Comcast, Verizon, AT&T and pals. Now, some of those BFA members are denouncing the coalition’s stance on net neutrality, or saying they had no idea why they were listed as coalition members to begin with. Vice, which first reported on the bizarre op-ed pieces being pushed by leadership of Broadband For America and the fact that the coalition is almost entirely funded by a single donation from the National Cable and Telecom Association, reached out to follow up with some of the oddball names in the BFA members list and found that not everyone backs the coalition. The executive director of the Ohio League of Conservation Voters tells Vice he has no idea why his group is listed as a BFA member. As of this morning, OLCV is still listed on the BFA list. So is the Spread Eagle Tavern & Inn, where the accountant tells Vice that he doesn’t know what the bed and breakfast is doing on the BFA website.